All of you have heard of “Just Culture” (JC). At heart, it is an attitude toward investigating and explaining errors that occur in organizations in terms of “why” an error occurred, including systemic reasons, rather than focusing on identifying someone to blame. How might JC be applied in practice? A paper* by Shem Malmquist describes how JC concepts could be used in the early phases of an investigation to mitigate cognitive bias on the part of the investigators. He recommends that, from the get-go, investigators categorize all pertinent actions that preceded the error as an error (unintentional act), at-risk behavior (intentional but for a good reason) or reckless (conscious disregard of a substantial risk or intentional rule violation). (p. 5) For errors or at-risk actions, the investigator should analyze the system, e.g., policies, procedures, training or equipment, for deficiencies; for reckless behavior, the investigator should determine what system components, if any, broke down and allowed the behavior to occur. (p. 12). Individuals should still be held responsible for deliberate actions that resulted in negative consequences. Adding this step to a traditional event chain model will enrich the investigation and help keep investigators from going down the rabbit hole of following chains suggested by their own initial biases. Because JC is added to traditional investigation techniques, Malmquist believes it might be more readily accepted than other approaches for conducting more systemic investigations, e.g., Leveson’s System Theoretic Accident Model and Processes (STAMP). Such approaches are complex, require lots of data and implementing them can be daunting for even experienced investigators. In our opinion, these models usually necessitate hiring model experts who may be the only ones who can interpret the ultimate findings—sort of like an ancient priest reading the entrails of a sacrificial animal. Snide comment aside, we admire Leveson’s work and reviewed it in our Nov. 11, 2013 post. This paper is not some great new insight into accident investigation but it does describe an incremental step that could make traditional investigation methods more expansive in outlook and robust in their findings. The paper also provides a simple introduction to the works of authors who cover JC or decision-making biases. The former category includes Reason and Dekker and the latter one Kahneman, all of whom we have reviewed here at Safetymatters. For Reason, see our Nov. 3, 2014 post; for Dekker, see our Aug. 3, 2009 and Dec. 5, 2012 posts; for Kahneman, see our Nov. 4, 2011 and Dec. 18, 2013 posts. Bottom line: The parts describing and justifying the author’s proposed approach are worth reading. You are already familiar with much of the contextual material he includes. * S. Malmquist, “Just Culture Accident Model – JCAM” (June 2017). According to an item* in World Nuclear News, the World Association of Nuclear Operators (WANO) and the Organisation for Economic Co-operation and Development’s Nuclear Energy Agency (NEA) signed a memorandum of understanding to cooperate on "the further development of approaches, practices and methods in order to proactively strengthen global nuclear safety." One objective is to “enhance the common understanding of nuclear safety culture challenges . . .” In addition, the parties have identified safety culture (SC) as a "fundamental subject of common interest" and plan to launch a series of "country-specific discussions to explore the influence of national culture on the safety culture". As usual, the press release touts all the benefits that are going to flow from the new relationship. We predict the flow will be at best a trickle based on what we’ve seen from the principals over the years. Following is our take on the two entities. WANO is an association of the world's nuclear power operators. 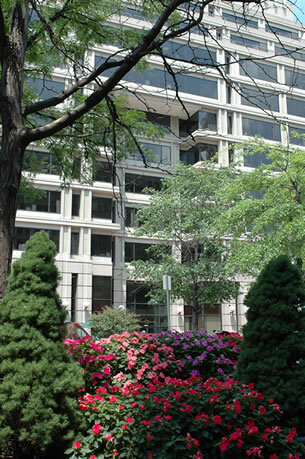 Their objective is to exchange safety knowledge and operating experience among its members. We have mentioned WANO in several Safetymatters posts, including Jan. 23, 2015, Jan. 7, 2015, Jan. 21, 2014 and May 1, 2010. Their public contributions are generally shallow and insipid. WANO may be effective at facilitating information sharing but it has no real authority over operators. It is, however, an overhead cost for the economically uncompetitive commercial nuclear industry. NEA is an intergovernmental agency that facilitates cooperation among countries with nuclear technology infrastructures. In our March 3, 2016 post we characterized NEA as an “empty suit” that produces cheerleading and blather. We stand by that assessment. In Safetymatters’ history, we have come across only one example of NEA adding value—when they published a document that encouraged regulators to take a systems view of SC. See our Feb. 10, 2016 post for details. No one should expect this new arrangement to lead to any breakthroughs in SC theory or insights into SC practice. It will lead to meetings, conferences, workshops and boondoggles. One hopes it doesn’t indirectly raise the industry’s costs or, more importantly, distract WANO from its core mission of sharing safety information and operating experience across the international nuclear industry. 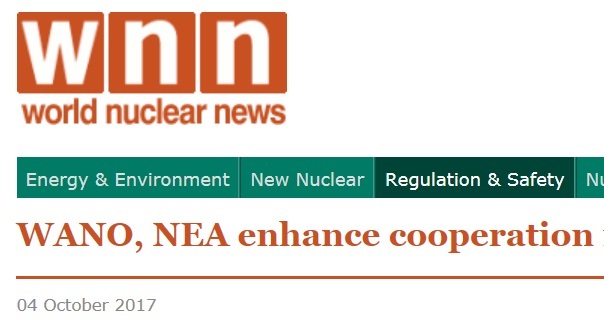 * “WANO, NEA enhance cooperation in nuclear safety,” World Nuclear News (Oct. 4, 2017).